Suzanne Martel, née Chouinard, was born in Quebec City, Canada. Along with her sister Monique (later Monique Corriveau) she began writing as a child and created more than 40 fictional characters. Later these characters began the basis for their literary saga of the history of Quebec. Suzanne studied at the École des Ursulines and the University of Toronto. She worked as a journalist for the Quebec newspaper Le Soleil before becoming a freelance writer. She married Maurice Martel, a lawyer, with whom she had six sons. In 1963, she published her first novel for young people, the prize-winning Surréal 3000 (in English, The City Under Ground), now a classic and said to be the first science fiction novel in Quebec. In 1971, she founded the weekly children's publication Safari and served as its editor until it was sold in 1974. 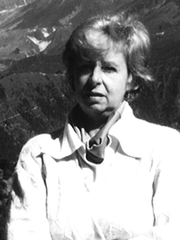 She is considered one of the greatest novelists of adventure both in Quebec and Canada. Among her most popular works was Jeanne, Fille du Roy (English: The King's Daughter, 1974), about one of the young Frenchwomen who emigrated to Canada in the 17th century. Suzanne Martel is currently considered a "single author." If one or more works are by a distinct, homonymous authors, go ahead and split the author. Suzanne Martel is composed of 2 names. You can examine and separate out names.